The best alternative news program around. I for years have watched "Inside Edition" this little 30 minute news program is informative and entertaining, and it's good the program runs on a daily basis even though it's syndicated. 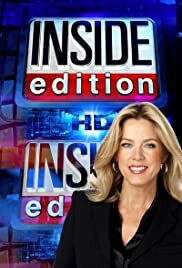 "Inside Edition" mostly focuses on and reports news of the famous and the stars, though from time to time they have stories about the everyday citizen. True over the years, as just with any news show changes come and go, as this program use to report more on crime and world events, still the reports come in but mostly it's scandals of the famous and political figures. The latest Hollywood news is reported daily including movie news, relationship gossip, book releases, and reports on upcoming DVD's and magazines, and the awards coverage and star interviews are top notch. I must say it's always a pleasure to tune in and see this show hosted by ex Georgia beauty queen Deborah Norville, she always dresses in the most colorful and elegant clothing she makes just a fabulous host and does such a fine job. Interviews and reporting of awards shows and hot stories are done now by the beautiful and voluptuous Lisa Guerrero, who was a former "Monday Night Football" sideline reporter, well Lisa has now found her niche as an entertainment reporter. "Inside Edition" is always a pleasure to watch it's clearly the best alternative news show around.